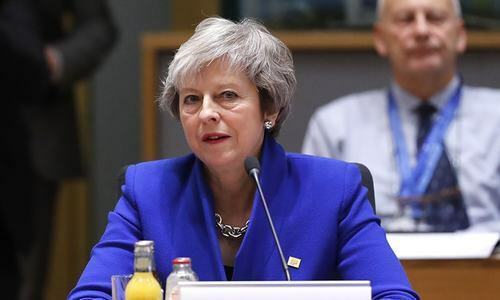 LONDON: Prime Minister Theresa May’s Brexit deal came under fire from allies and opponents alike on Wednesday after the government was forced to publish legal advice showing the United Kingdom could be locked indefinitely in the European Union’s orbit. After a string of humiliating parliamentary defeats for May the day before cast new doubts over her ability to get a deal approved, US investment bank J.P. Morgan said the chances of Britain calling off Brexit altogether had increased. May is trying to get her deal approved by a parliament which shows every sign of striking it down in a vote on Dec 11. It is unclear what happens if the deal is rejected as Britain is due to leave on March 29. On Tuesday, just hours before the start of a five-day debate in the British parliament on the deal, a top law official at the Euro­pean Court of Justice said UK could pull back its formal divorce notice. “The UK now appears to have the option of revoking unilaterally and taking a period of time of its own choosing to decide what happens next,” J.P. Morgan economist Malcolm Barr wrote in a note to clients. He placed a 10 per cent probability on a no-deal Brexit, down from 20pc, and a 50pc probability on an orderly Brexit, down from 60pc. The chance of no Brexit at all doubled to 40pc from 20pc.